Kitchen renovations can do wonders for your home but can lead to unforeseen expenses and inconveniences, from unusable cabinet doors to clashing colors and textures. If you’re planning a kitchen remodel soon, make sure you have a game plan that includes the details homeowners often forget. While you’re planning and installing new cabinetry, don’t forget to think about function in addition to form. Your cabinets and drawers must have room to open all the way – without getting in the way of one another, walls or appliances – and they should open in the right direction. This is easy to miscalculate, especially if you draw your design inspiration from dream kitchen photos in which every door is closed. You’ve probably put a lot of thought into your color scheme, including the colors of metals for your appliances. As you choose your faucets, lights, handles, drawer pulls, and other kitchen fixtures, make sure you keep a consistent aesthetic to avoid clashes. Pay attention to color, texture and glossiness as you pick out different fixtures. Shiny brass and brushed nickel may clash, but different tones of brushed metal may complement one another. 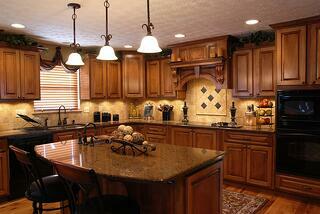 The most beautiful custom kitchen in the world will still look lackluster with insufficient lighting. Your light fixtures and lightbulbs should accentuate the surfaces of your kitchen, with options that provide plenty of bright light for kitchen prep when needed. Make sure you’re also taking advantage of natural lighting. Motorized window shades can give a seamless, modern look while allowing you to adjust sunlight any time you want.